British Prime Minister Theresa May sought a stronger response to terrorism after three attackers killed seven people in London on Saturday. "It is time to say enough is enough," May said in a televised statement outside her Downing Street office. The attrackers drove a van into pedestrians on London Bridge and stabbed others nearby, killing seven people and injuring 48. "We cannot and must not pretend that things can continue as they are," May said, calling for a beefed-up counter-terrorism strategy that could include longer jail sentences for some offences and new cyberspace regulations. London's Metropolitan Police arrested 12 people in the Barking district of east London in connection with the attack and raids were continuing there, the force said. The arrests in Barking, east London, followed a raid at a flat belonging to one of the three attackers, BBC reported. Controlled explosions were also carried out at the flat in Barking on Sunday morning. According to neighbours, the dead attacker had lived there for about three years and was married with two children. 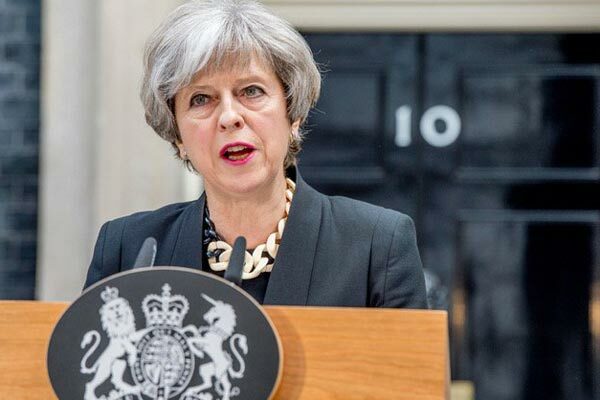 Most political parties have suspended national general election campaigning, but the prime minister said full campaigning would resume on Monday and the general election would go ahead as planned on Thursday, BBC said. Three men then got out wearing fake bomb vests and began attacking people in the nearby market - an area known for its bars and restaurants, which were busy on a warm summer evening. One of them was an off-duty officer and amateur rugby player who tackled one of the terrorists, suffering stab wounds. Another, a British Transport Police officer who joined the force less than two years ago, took on the attackers armed with only his baton.